Several common authentication schemes are not secure over plain HTTP. In particular, Basic authentication and forms authentication send unencrypted credentials. To be secure, these authentication schemes must use SSL. In addition, SSL client certificates can be used to authenticate clients. Create or get a certificate. For testing, you can create a self-signed certificate. For details, see How to Set Up SSL on IIS 7. 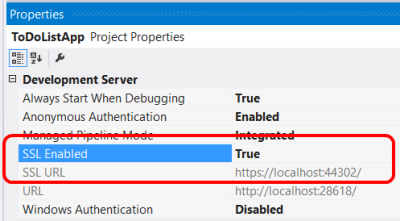 For local testing, you can enable SSL in IIS Express from Visual Studio. In the Properties window, set SSL Enabled to True. Note the value of SSL URL; use this URL for testing HTTPS connections. SSL provides authentication by using Public Key Infrastructure certificates. The server must provide a certificate that authenticates the server to the client. It is less common for the client to provide a certificate to the server, but this is one option for authenticating clients. To use client certificates with SSL, you need a way to distribute signed certificates to your users. For many application types, this will not be a good user experience, but in some environments (for example, enterprise) it may be feasible. - Certificate credentials are stronger than username/password. - SSL provides a complete secure channel, with authentication, message integrity, and message encryption. - You must obtain and manage PKI certificates. - The client platform must support SSL client certificates. Click the site node in the tree view. Double-click the SSL Settings feature in the middle pane. Accept: IIS will accept a certificate from the client, but does not require one. The SslNegotiateCert flag means IIS will accept a certificate from the client, but does not require one (equivalent to the "Accept" option in IIS Manager). To require a certificate, set the SslRequireCert flag. For testing, you can also set these options in IIS Express, in the local applicationhost.Config file, located in "Documents\IISExpress\config". Makecert will prompt you to enter a password for the private key. Under File, select Add/Remove Snap-In. Select Local computer and complete the wizard. Under the navigation pane, expand the "Trusted Root Certification Authorities" node. On the Action menu, point to All Tasks, and then click Import to start the Certificate Import Wizard. Browse to the certificate file, TempCA.cer. makecert.exe -pe -ss My -sr CurrentUser -a sha1 -sky exchange -n "CN=name"
On the server side, you can get the client certificate by calling GetClientCertificate on the request message. The method returns null if there is no client certificate. Otherwise, it returns an X509Certificate2 instance. Use this object to get information from the certificate, such as the issuer and subject. Then you can use this information for authentication and/or authorization.